When you have been injured in an accident on a Missouri road, the first thing you should do is seek medical treatment and get on the path to recovery. Then you should contact an experienced personal injury lawyer at M. Blake Heath, Trial Attorney LLC The earlier we can investigate the accident scene, the better, especially if a highway defect was involved. Because highway defect cases can be complex and often involve third parties, it is very important that you hire a personal injury attorney with the experience to tackle these cases. While you can sue the department of transportation, it is more likely that the lawsuit will involve a third party—the maker of the guardrail or the subcontractors who actually did the road work, for example. 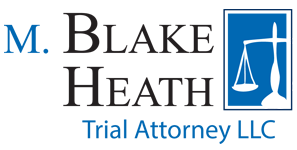 At M. Blake Heath, Trial Attorney LLC, we know the right questions to ask and the right places to find answers. Our attorneys have been recognized by their peers as exceptional litigators, and their track record of verdicts and settlements speaks for itself. We predominantly handle personal injury cases, including semi truck accidents, catastrophic personal injury, and products liability, among others. As a small firm, we can provide personal service without sacrificing the resources of a larger firm. If you have been injured in a car accident caused by a highway defect on a Missouri road, contact an experienced personal injury attorney at M. Blake Heath, Trial Attorney LLC for a free case evaluation.